Send or Agents&apos; CircularHmkley Knitting Machine Co., 176 Broadway. 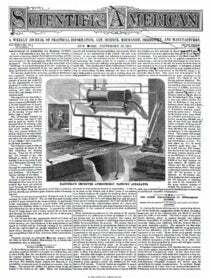 We desire to contract with patentees and capitalists for the manufacture of any useful and saleable machinery. ???? share profits as part compensivtion. Our facilities for casting and finishing are unsurpassed. Address Stevenson & Sears, Machinists, Qpper Sandusky, Ohio. All Steam Engine Manufacturers send circular and price list to W. A. Helms, Shady Hill, Tenn. Cockle dealers and consumers address, with price, Andrews & Godfrey, Greenevillc, Tenn. Manufacturers of small brass articles, such as tape lines, etc., etc., please send their address to G. ?. Dean, 14 Catharine st., ??? York. WantedA contract for the manufacture oi specialties, either hardware or tools. C. N. Trump, Machinist, Portchester, N. Y. Man'f'rsof grain-cleaning machinery andotherscan have sheet zinc perforated at 2c. per sq. ft. K. Aitchison & Co., 845 State st Chicago. The great scarcity of water in our large cities is mainly caused by the enormous quantity wasted, which can be prevented by using the Boston eafety Faucet (self-closing), the saving of water in one building in this city being over 200,000 gallons in three months. For sale by Joseph Zane & Co., 81 Sudbuiy st., Boston, Mass. Bartlett's Needle Factory Depot 569 Broadway, New York. To Inventors.Garrison's Model and Exchange Rooms, for exhibition of models and sale of rights. No. 5 Arcade Court, Chicago, 111. We advertise ne?V inventions extensively. WantedTo communicate with any party who has a practical knowledge of building and running a powder mill. Address " W," P. O. Box 5,692, New York city. Send for a circular on the uses oi Soluble Glass, or Silicates oi Soda and Potash,flre and water-proof. Manufactured by L. & J. W. Feuch-twanger. Chemists and Drug Importers, 55 Cedar st.. New York. you want the real oak-tanned leather-belting, C. W. Arny manufactures it. See advertisement. Peck's patent drop press. For circulars, address the sole manufacturers, Milo Peck & Co., New Haven, Ct. Excelsior Turbine Water WheelThe patentee of this superior ?vheel desires to enter into arrangements with millwrights and manufacturers with a vie?V to having them manufacture and sell the cheapest, most durable, and po?verful ?vheel used in this country. Full particulars given by circular. Address Isaac S. Roland, Reading, Pa. Minn. State Fair.To Advertisers. Send for Circular to Post, Rochester, Minnesota. S. S. Pollard's celebrated Mill Picks,137 Raymond st.,Brooklyn. Chas. P. Williams, No. 327 Wahiut st., Philadelphia, Analytical and Consulting Chemist, and Metallurgist. Materials for all Mechanics and Manufacturers, mineral sub-stancesp drugs, chemicals, acids, ores, etc., for sale by L. & J. ??. Feueht-wanger. Chemists, Drug, and Mineral Importers, 55 Cedar st.. New York. Postoffice Box36lG. Analyses made at short notice. Ulster Bar Iron, all sizes, rounds, squares, flats, ovals, and half-ovals, for machinery and manufacturing purposes, in lots to suit purchasers. EelestonBrothers & Co., 166 South st.. New York. Mill-stone dressing diamond machine, simple, effective, durable Also, Glazier's diamonds. John Dickinson, 64 Nassau st.. New York. Loschot's Patent Diamond-pointed Steam Drills save, on the average, fifty per cent ol the cost of rock drilling. Manufactured only by Severance & Holt, 16 Wall st.. New York. For solid wrought-iron beams, etc., see advertisement Address Union Iron Mille, Pittsburgh, Pa., for lithograph, etc. ] Machinists, boiler makers, tinners, and workers of sheet metala ' read advertisement of the Parker Power Presses. Diamond carbon, formed into wedge or other shapes for point-U3g anil edging tools or cutters for drilling and working stone, etc. Send stamp for circular. John Dickinson, G4 Nassau st.. New York. The " Obmpound " Wrought-Iron Grate Bar is the best and cheapest. Send for circular. Handel, Moore & Co., 12 Pine street. Post-oflice Box 5,669. For sale by State or County the Patent Right ior the best Cul-ivator in use. For terms address Isaiah Henton, Shelbyville, 111. Hackle, Gill Pins, etc., at Bartlett's, 569 BroadAvay, Ncav York.